You might want to create a desktop shortcut for that file as you will probably use Control Center often. Control Center allows you to see the programs and files present on the EV3, allows you see the console (and keeps a record of what is displayed), allows you to remotely push the buttons on the EV3, start and stop programs, look at sensor values and control motors. In short, the Control Center is a very powerful and useful utility to get familiar with. With your EV3 connected to your development PC, start Control Center. In the name box you can type the name you assigned to your EV3 and click connect, or you click search to have Control Center find your EV3 for you. Note that the Control Center has a few quirks. If the connect to an EV3 fails, there is no error message. The Connect button will change back to the unpressed state and that is all that happens. At the same time, when the connect is successful, the Control Center may not give any indication that it has connected. You will need to click on one of the tabs to see if it updates the displays. 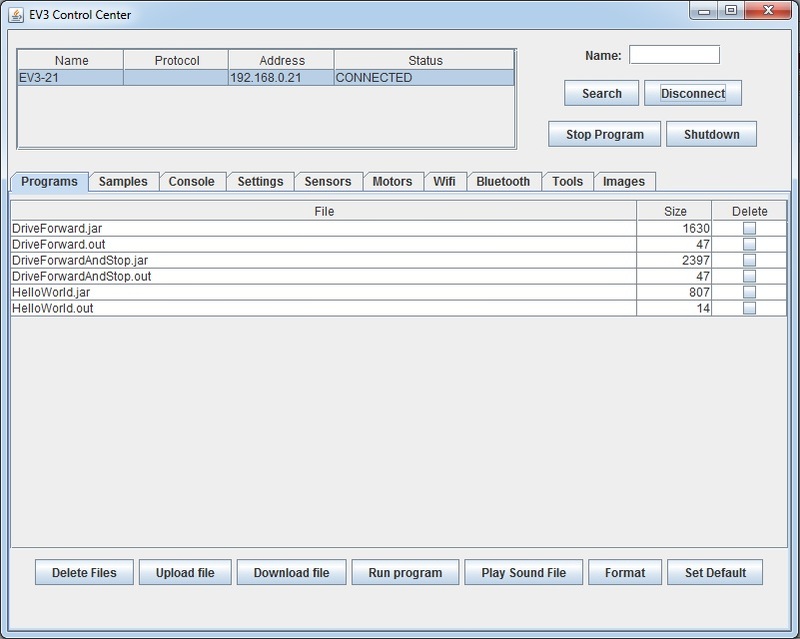 Start the Control Center and connect to your EV3 and take some time to explore what Control Center offers.